This year, the Lord gave me the word courageous as my word. In His usual way, He’s already given me several areas to stretch myself and trust in Him. One way I sense His nudges more is through praying for others. Well, nothing is special at all! He’s calling me to pray for and WITH complete strangers in public places. 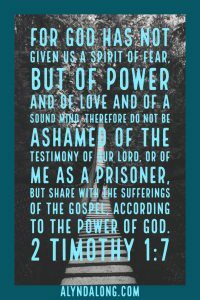 I love me some Jesus and I want to share His story of redemption in my life. But can’t I do it from my phone? Over coffee with a friend? Sure, I SHOULD do those things. But He wants me to find my courage in HIM. 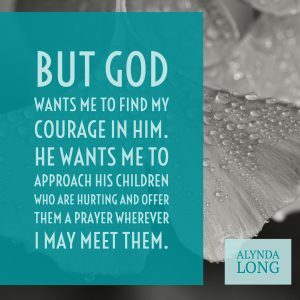 He wants me to approach His children who are hurting and offer them a prayer wherever I may meet them. One such person was the bagger at my local Kroger (shout out for #clicklist and all you organized people with enough sense to plan a shopping list and use that feature). I was standing in line at the grocery store. Just chatting with the cashier and the bagger like my ridiculously extroverted self. The cashier responded to my incessant babbling, but the bagger avoided eye contact with me. “How are you doing, today, sir?” I tried to engage him in conversation. Sorry, Holy Spirit, I don’t think he wants to talk. He finishes bagging my groceries, I say thanks and walk away. I don’t want to, Lord. Are you sure? I feel a bigger nudge… more like a push. Why did my word have to be courageous this year? FINE, I will ask him. He’ll say NO or think I have two heads! Awkwardly (as are many of the things I do… I’m good like that), I push my cart back to Mr. Bagger Man. Now I’m almost in tears. I ask if I can hold his hand and he agrees. I pray for him right there in the checkout lane of Kroger. I assume people were staring at us, but I didn’t notice them. He thanked me and squeezed my hand before letting go. Mr. James from Kroger is on my prayer reminder list every day at 7pm. We really never know what will happen if we listen to that gentle nudge of the Holy Spirit. Will you also join me in praying for Mr. James? How has He nudged you lately, my friend? Please share your experience in the comment section below. I’d love to hear from you, my friend! Alynda, thanks for sharing your story. Good for you to listen to God’s nudge and pray for James. What a powerful experience for him, and for all those that witnessed you praying for him. Your story gives me confidence to reach out to others in the same way and to be bolder in praying with others. Thank you so much, Anne! It is uncomfortable to stretch outside my comfort zone, but exciting to see where the Lord may lead! Praying for your boldness. Blessings to you! What a blessing being able to read your story and recognize that it can be uncomfortable following Christ, yet so rewarding. Thank you so much Cindy! It is exceptionally rewarding following His path! This is beautiful and your story is an encouragement! Thank you, Jaclyn! Blessings to you! I ᴡager he is PERFECT at іt!? Laughed Larry. Thanks so much for reading and commenting! Yes, they are so scary at first. I’m finding them less scary as I become more obedient. I know the Lord wants to use me for His kingdom and that is such a great honor, isn’t it? Blessings to you! I love your story and the example you set. How many times have I argued with the Lord saying “I’m not the one, I’m not ready, equipped, qualified?” And how many times have a regretted ignoring the push? Every one of them! I thank the Lord for what He is doing in your life and pray for the courage to answer “the nudge” next time. Lori, you are such a wonderful encourager! Thank you so much! I ignored His nudges for a really long time and always regretted it. I find the more obedient I am to His calls, the bolder I get. He wants to use us where we are with what we have. Blessings to you, my friend! I’m so thankful for you! I remember a nudge I got to pray for someone who’d been in line with me at Panera. I was alone there and in another state–so I figured I had nothing to lose. The woman I prayed for was so blessed that she blessed me. Gentle nudges we should not ignore. God bless! Nancy, there is a boldness that comes from anonymity, isn’t there? I’m so glad you prayed for her. What a gift to be obedient to our heavenly father! Blessings to you! Thank you so much for reading and commenting! Yes, I find when I don’t listen to His nudges, He PUSHES! lol Blessings to you! Wonderful post, Alynda. Love your story of James. I pray often to have these kind of divine-appointments as I go about my daily routine. So beautiful and powerful that you prayed for James. Now, I’m praying for him too. Oh, Alynda. This is so beautiful. How has the Lord nudged me? He has told me to be more vulnerable and open about my pain. He has instructed me to ask for prayer more. I can no longer tell someone I will pray for them. I have to pray with them. I am blessed and honored to do so, but I realize he is teaching me to stay engaged and commit their situation to prayer. Thank you for this beautiful message. What a blessing to pray with others. Don’t you find it brings you closer to them AND the Lord? So thankful for His nudges!